Any need to access services in the floor void (electrics, central heating etc) after the floor has been completed will be a real pain. A typical method of sound proofing a floor is shown to the right. The first thing to do is to remove the existing skirting boards, doors and floorboards. Fit mineral wool quilt between the joists. Either refit the original floor boards or cover the joists with sheets of 10 to 12mm plywood keeping a gap (5mm or so) between the flooring and the walls. Secure to the joists using nails. Cover the floor with 15mm mineral wool quilt, if you need to secure this to keep it flat, use an occasional 'dab' of adhesive under the quilt. Loosely cover the quilt with 20mm square edge plasterboard, do not secure this to the quilt and keep a gap between it and the walls. 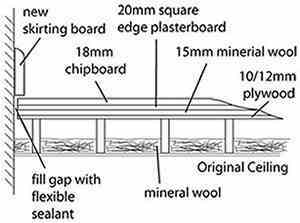 Cover the plasterboard with 18mm tongued and grooved flooring chipboard panels. Glue the chipboard together along the tongue and groove. Keep a gap between the chipboard and the walls. Fit a closing strip across the doorway where the edge of the 'sandwich' is exposed, leave a gap between the strip and the new floor. Fill the gap between the edges of the flooring 'sandwich' and wall/closing strip using a flexible sealant. Refit the skirting board (or fit new) leaving a gap (5mm or so) between the top of the floor and the bottom of the skirting board. Adjust the bottom of the door(s) as necessary to suit the new height of the floor and refit. The soundproofing floor is now complete, ideally it should be covered with carpet using a heavy duty underlay to further improve the noise deadening characteristics of the floor. There are commercial 'floor noise reduction' systems available, the main difference being that the 10mm mineral wool quilt and plasterboard are replaced by specially produced noise absorbent material. These systems often raise the floor by a smaller amount that the system explained above, but adjustment to skirting and doors will still be necessary.